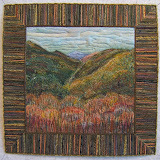 One of the panels from Prairie Performance is entered in the Quilting Gallery's weekly contest. Today is the first for voting, which you can do up until midnight on Sunday. 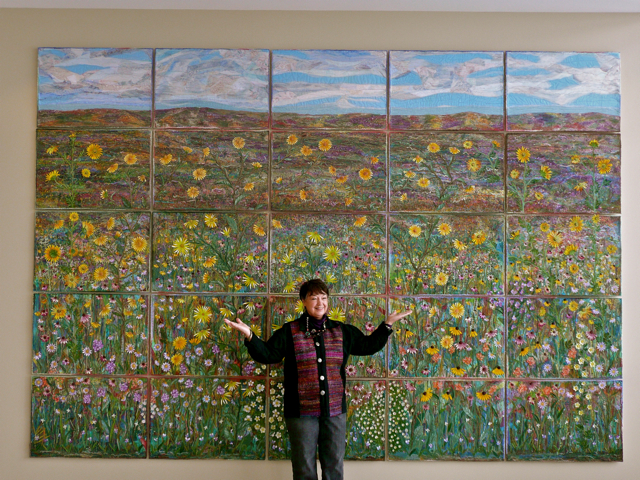 Prairie Performance - 33"x 23"
This is one panel of twenty-five that makes up a whole landscape of prairie flowers indigenous to northern Illinois. It's created with mostly recycled materials, including old army blankets for batting. 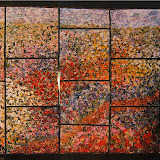 Each of the twenty-five panels are complete compositions that can stand alone. Thought you may like to see a photo of the complete installation at the New Sherman Hospital in Elgin, Illinois. Prairie Performance Installation - 167" x 117"
Many of my followers may recall the many posts of its creation over a period of nine months. For old times sake here's my favorite photo during that time ... it's when I fully realized the scale of this commissioned project. I thought you'd enjoy seeing the quilts that earned the Special Award Ribbons at this year's Smoky Mountain Quilt Show that took place this past weekend on the campus of Maryville College. Original designed on graph paper. Authentic Tennessee feed sack fabrics are the intended showcase of this quilt with hand applique, hand embroidery and hand quilting. Turkey Red background with red embroidery. Each original basket features a different feed sack with ruched handle, upper edge and flower along with matching feed sack appliqued dog teeth along edge. Scale changes for interest in area of quilting and dog teeth applique. My inspiration was a photograph taken by Mara Fulmer, Professor at Mott College, that was one of the last taken of my son, Alexander Earl White - 1981-2001, on a class trip to Fiji. Further inspiration was a collection of Alex's art sketches. Never say you CAN'T ....(draw, spell, swim), I didn't think I could do this ... until I TRIED. Home machine raw edge applique, thread play, paper pieced points, machine appliqued turned bias, border, fabric art flowers, Warm and Natural batting. 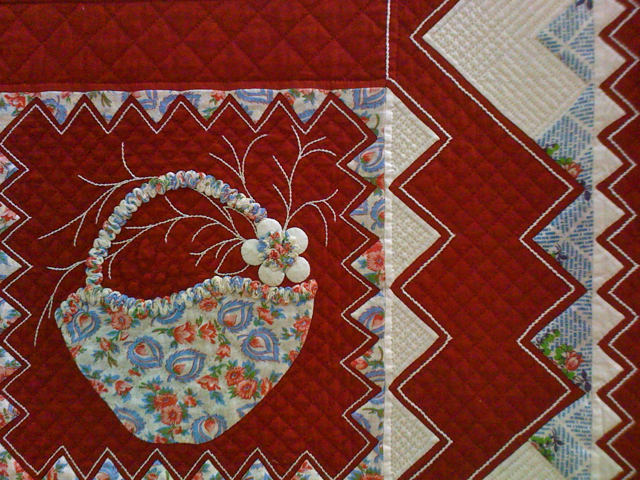 Quilted on a Tin Lizzie 18. This quilt was made for my son Daniel and his bride Laura, to celebrate their marriage. The fabric line, Charisma by Chez Moi for Moda, was used since Laura likes bright colors. Daniel wanted a boat. 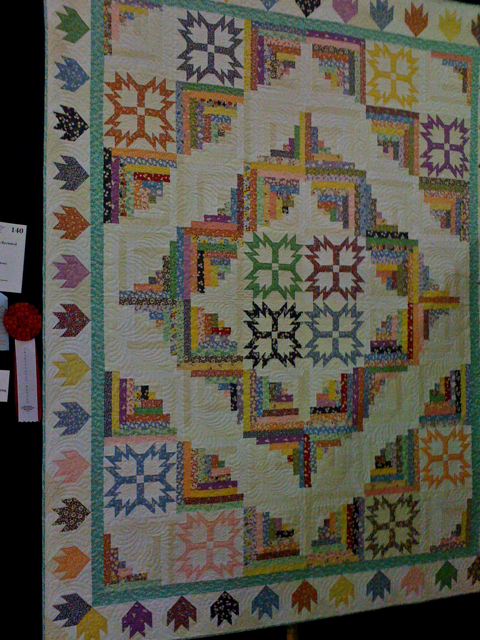 Quilted by Vicky Strongsky. 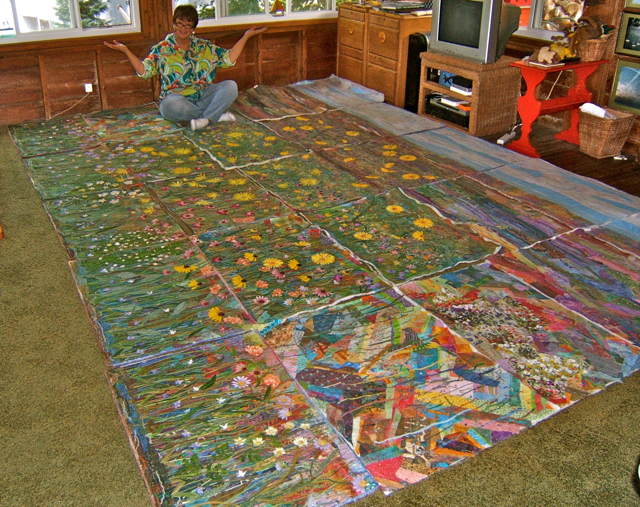 This quilt consists of 311 three-inch Nine Patch blocks and 310 three-inch Hourglass blocks. The Hourglass blocks are done in two shades of beige and only visible upon close examination of the quilt. The border is an applique flower design. 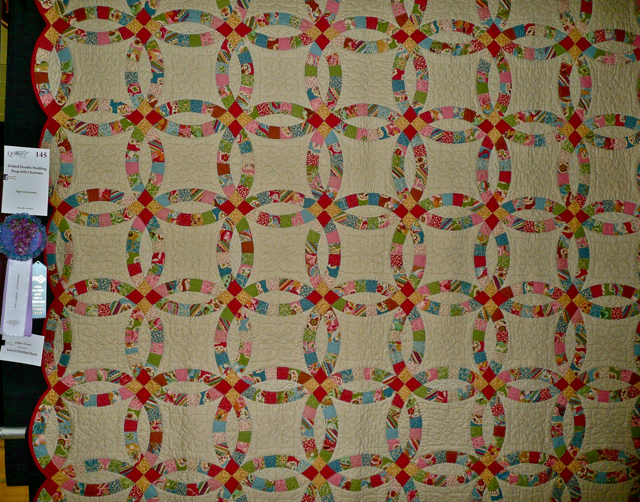 The quilt is machine pieced with a hand appliqued border and is hand quilted. 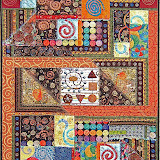 Over time I have seen many Nine Patch quilts and Hourglass blocks, and I when I saw the quilt pattern in "Quick and Easy Scrap Quilts" by Leisure Arts and Oxmoor House, I liked everything except the border. 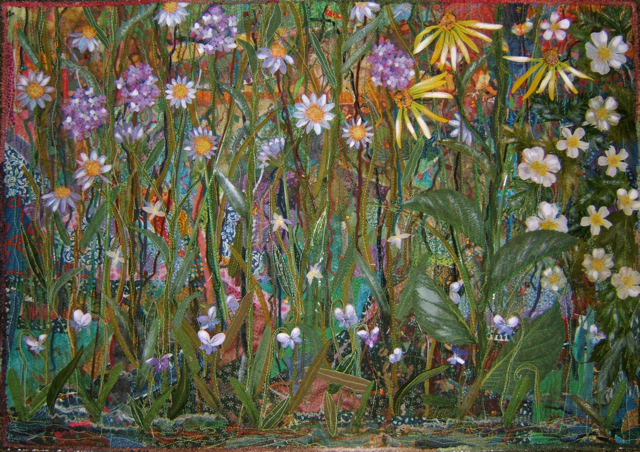 I enlarged the quilt to queen size and changed the flower in the border to one that was more pleasing to me. 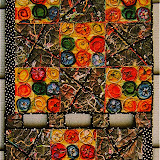 I used the book, "A Baltimore Album" by Marsha Radtke, but substituted seven blocks designed by Pat Andreatta. 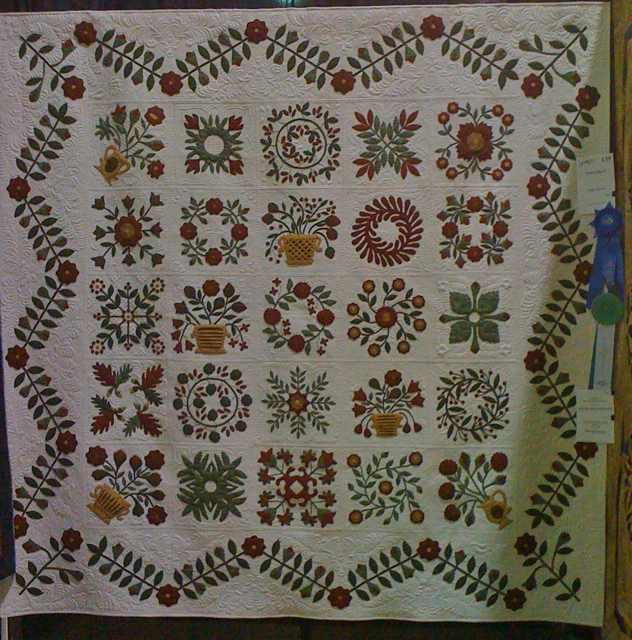 Kathy Drew did the longarm quilting. I had been collecting thirties fabrics for some time when I came across this pattern and thought they would be great for it. The pattern is from "Log Cabin Quartet Book" revised by Noella Kalal. 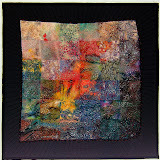 Machine quilted by Cyndi Herman. 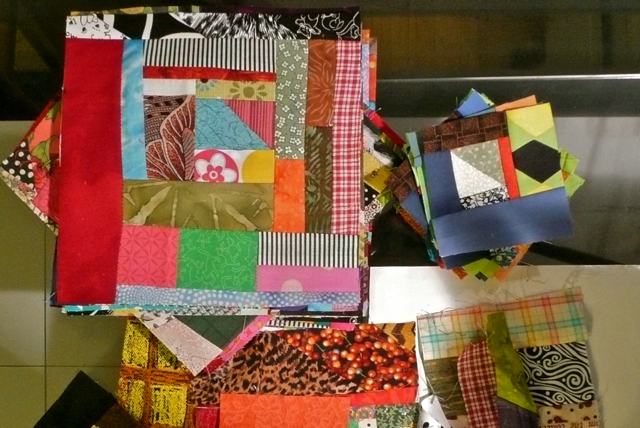 Bright scraps make a colorful kid's quilt. I copied the pattern from a friend's quilt. 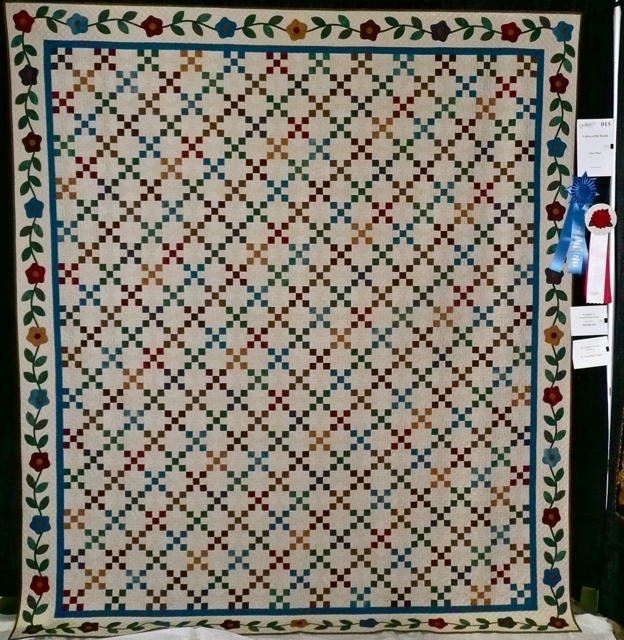 This quilt was constructed after attending Cincy Blackberg's class for Mountain Blossoms pattern. 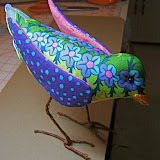 It is machined pieced, but embroidery, applique and quilting were done by hand. This quilt was made with a few of favorite things in quilt making: traditional pieced blocks, pieced border and applique border. I put the Bear Paw block in the center because it is the symbol of our guild. 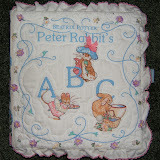 On the other hand, the applique border was designed to be as simple as possible to bring focus into the center blocks. 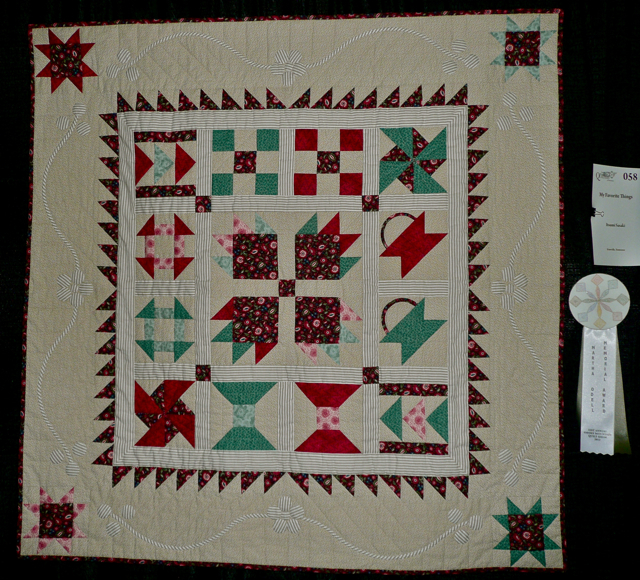 The stars and log cabin squares were created using a variety of scraps. the dark background was used to set off the star blocks. The patter is "Eldon" from Laundry Basket Quilts. 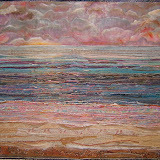 It's quilted by JoAn Knight. I saw the sitting lion with a bird friend in a grandchild's story book. I love "big cats." 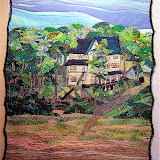 It's quilted by Kathy Drew. Bits and pieces of Elvis-related stuff that I collected over a period of several years with the intent of making a crazy quilt ended up in this piece. It's become the latest creation in a newly developed style I call "unraveled." It's a gift for my husband, the world's greatest tongue-in-cheek Elvis fan. There were 1272 attendees at this year's show. 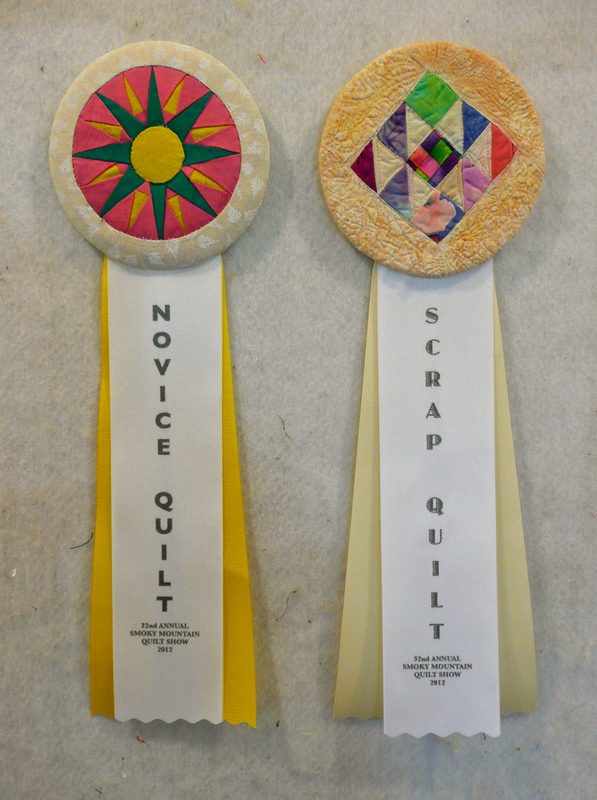 Many cast a vote for their favorite quilt to determine the winner of this award. 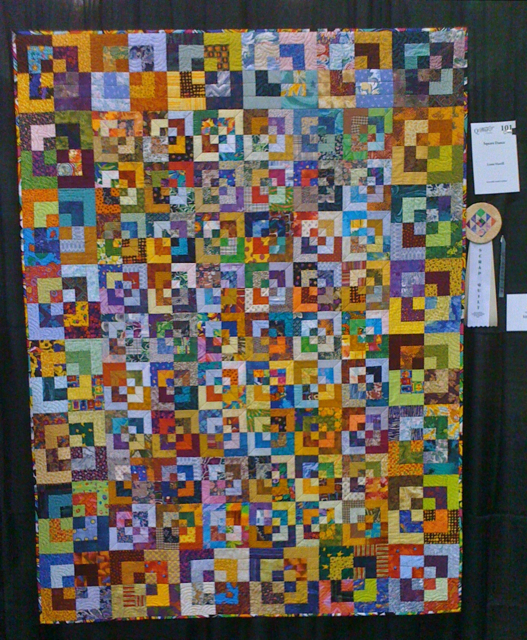 (The boy in the only photo of this quilt that I could locate is the son of an attendee). Christ, the lamb of God, at his second coming will return on a cloud and we will praise his name for all eternity. 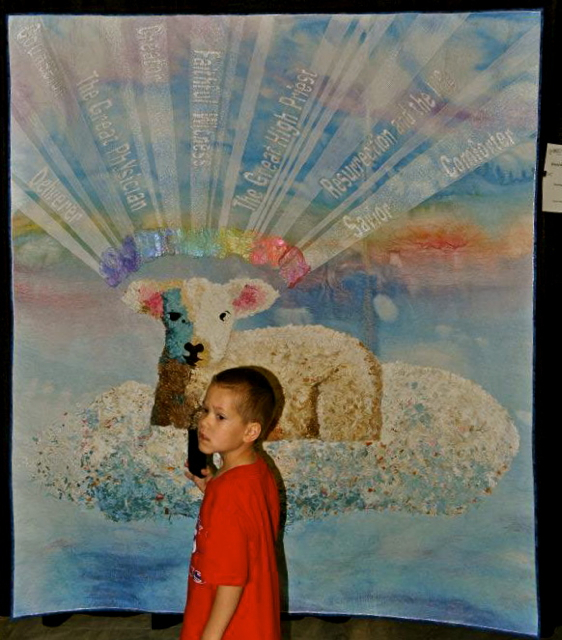 The lamb and cloud were made using the confetti method and the halo, as described in Revelation, was made with Angelina. I hand painted the background. Original design, lamb photo courtesy of Christopher Renner, Rutland. There were 178 entries to make this a fabulous show. Many of them awarded with 1st, 2nd, and 3rd places, as well as honorable mentions, in 14 categories. 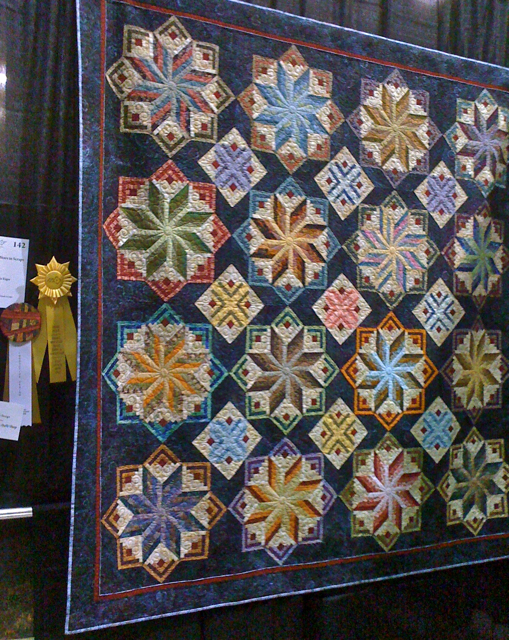 The list of award winning quilts is too long for me to write out. 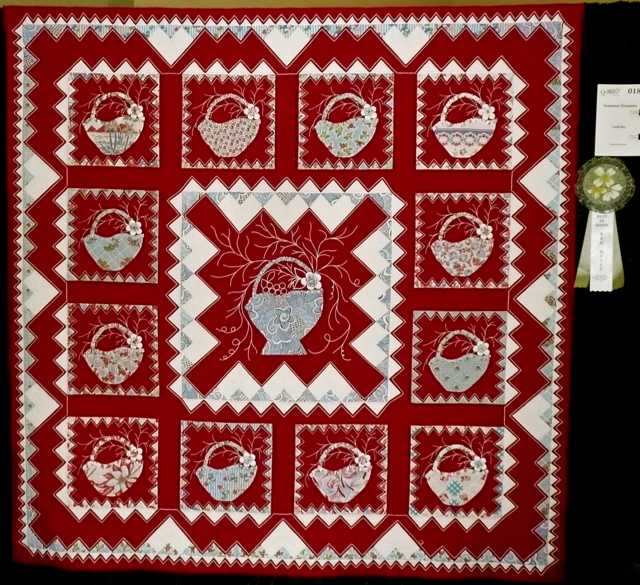 When (or if) a slideshow of the winning quilts is posted on the Smoky Mountain Quilt Guild site, I'll post a link so you can see them. 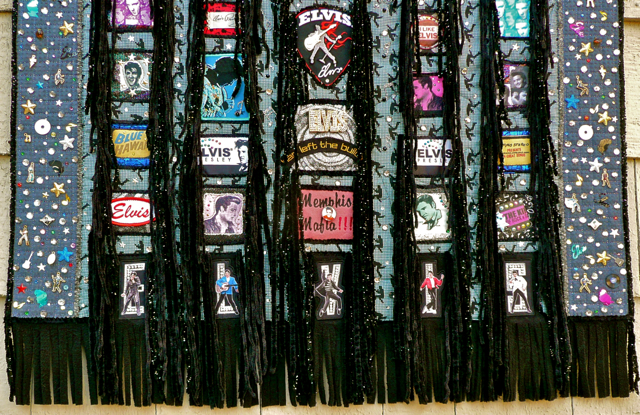 Here's the backside of "My Velvet Elvis" that's exhibited in the Smoky Mountain Quilt Guild Show. 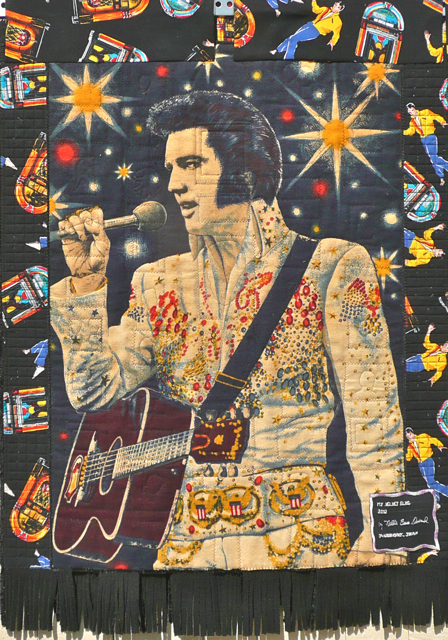 The main body of the quilt has the heavy flannel with the image of Elvis. It had been a damaged wall hanging that was in a friend's shop. Nobody wanted to buy it at even a much reduced price so he gave it to Lee. You may recognize the fabric in the three borders. I think it was one of the early ones on the market a number of years ago. 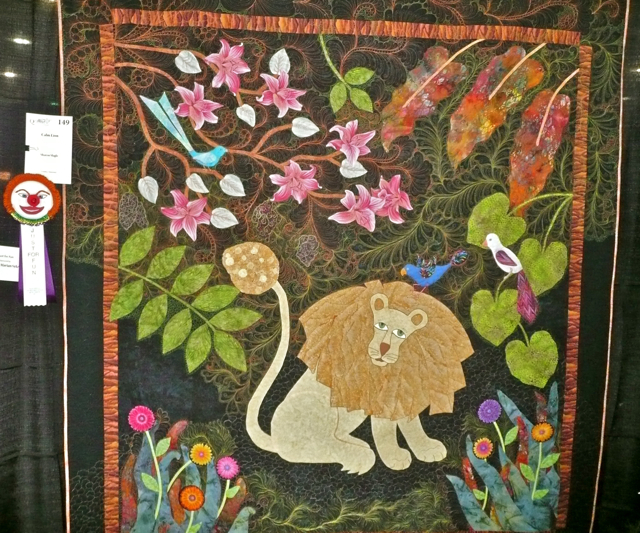 Today is the last of the three day quilt show. So by tonight the above picture of Elvis will be up against the wall of the shrine room while the other side adds even more sparkle to room. 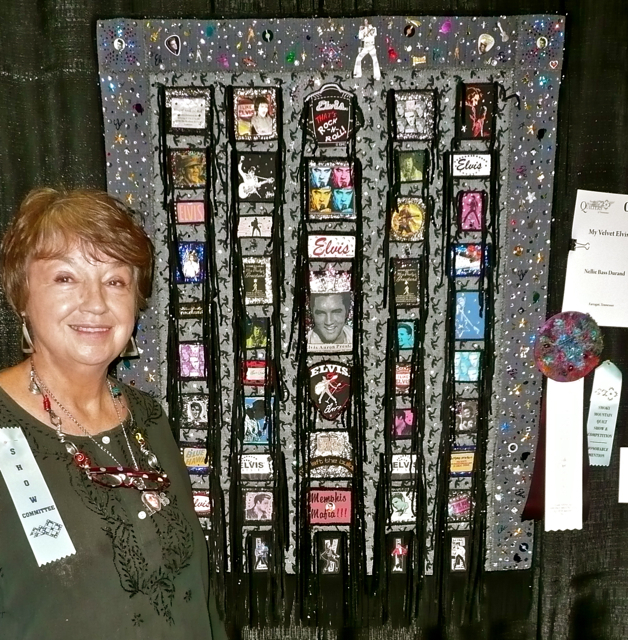 The 2012 Smoky Mountain Quilt Guild Show and Competition opened this morning. 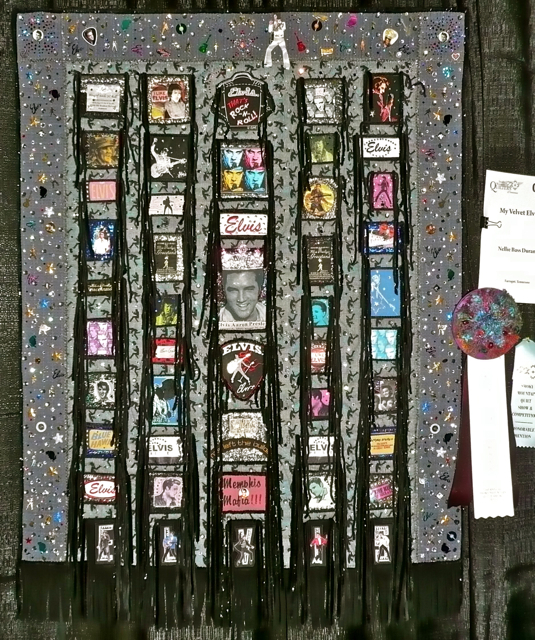 I'm pleased to say that my one and only entry was awarded an Honorable Mention in the Art Quilt Category PLUS the Embellishment special award ribbon. The show runs tomorrow from 9am to 5pm and on Sunday from 11am to 4pm. I'll be there both afternoons. Here's a better photo of just the quilt. 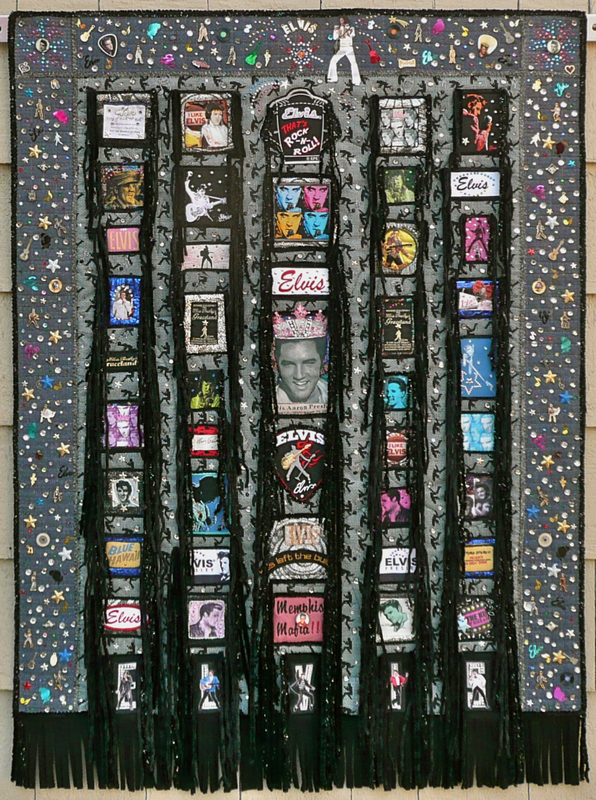 My Velvet Elvis - 29"x 39"
"My Velvet Elvis" was delivered along with the special award ribbons for this year's quilt show. Once again, I was in charge of getting them made. A number of talented guild members were invited to create rosettes to represent specific awards. The ribbons are printed on my home printer and then I construct each one. 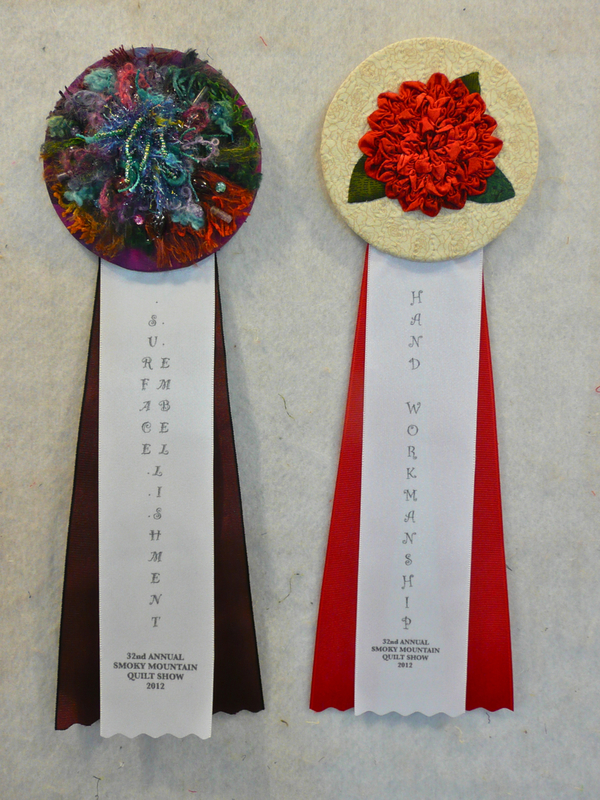 "Surface Embellishment" rosette is created by Bridgette Matlock, the chairperson for this year's show. 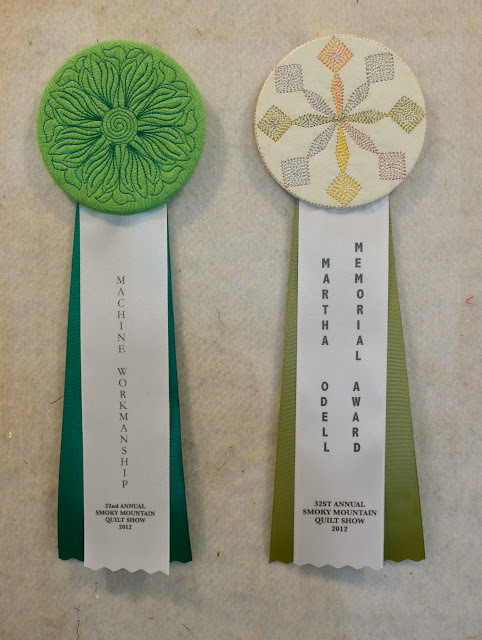 The "Hand Workmanship" rosette is created by Isumi Sasaki. 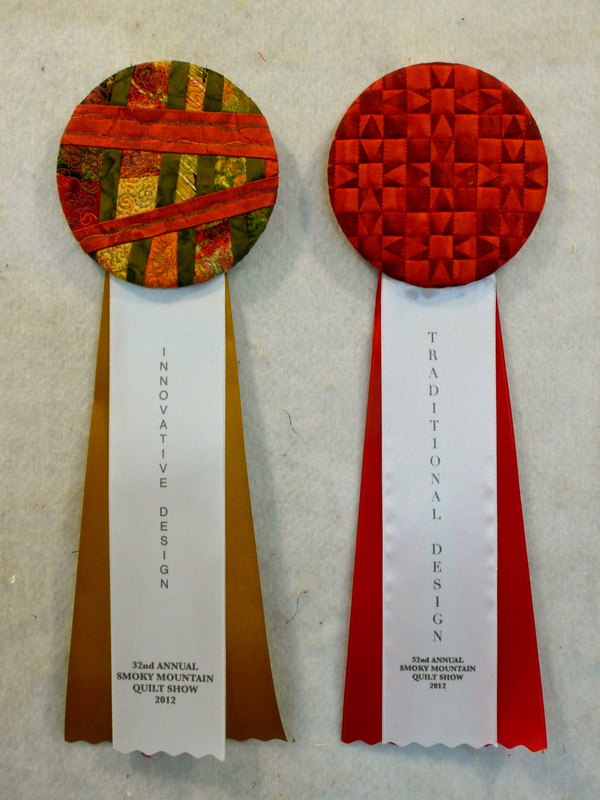 "Innovative Design" rosette is created by Tone Haugen Cogburn and the "Traditional Design" one by Loretta Painter. 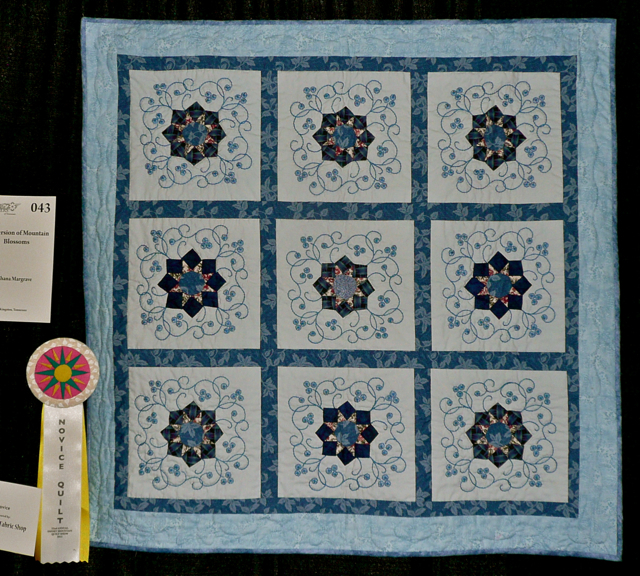 "Novice Quilt" rosette is created by Jane Dunham and the "Scrap Quilt" one by Leona Harden. "Machine Workmanship" rosette is created by Cyndi Herrmann and the award presented in memory of one our deceased guild members is created by Linda Roy. "Just For Fun" rosette is created by Sandy Kambic and the "Viewer's Choice" one is created by me. 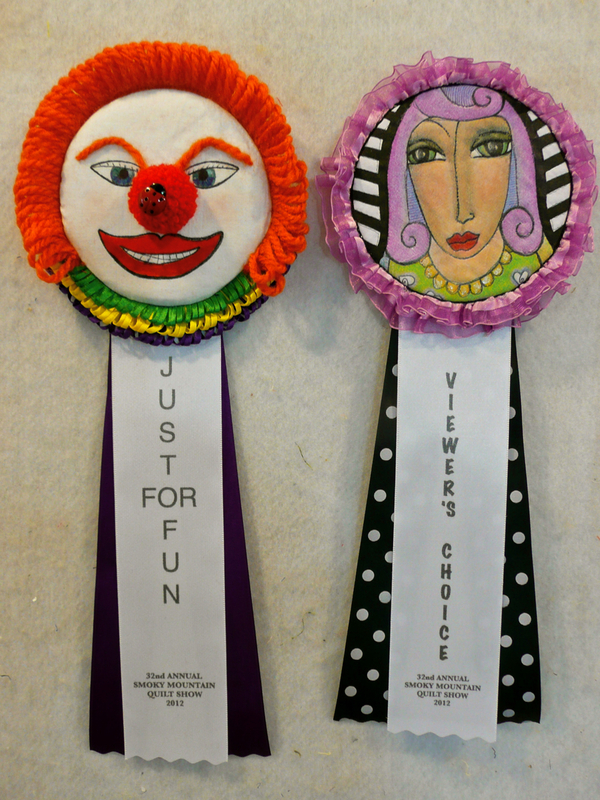 I also created the two "Best In Show" rosettes as well as the one for the "Judge's Choice" award ribbon. 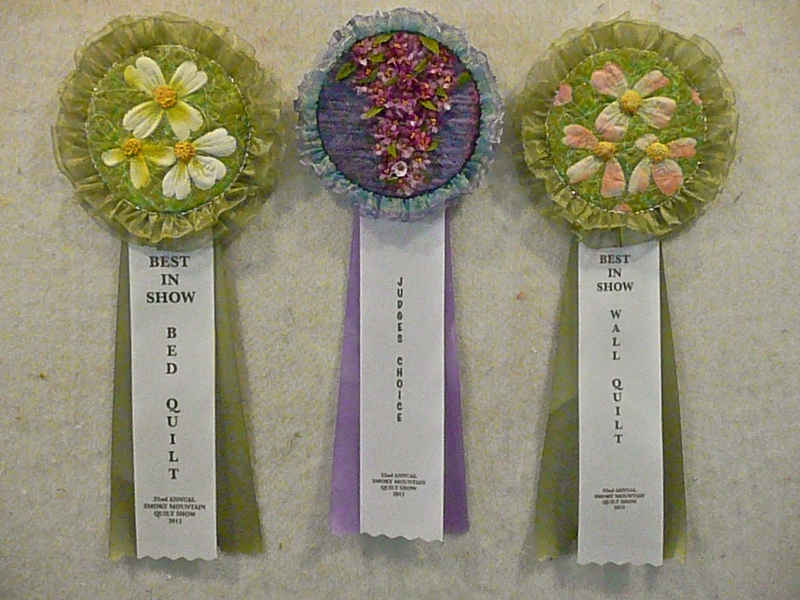 When the show is over this next Sunday I'll post which quilts won these awards. My entry for Smoky Mountain Guilt guild show is ready for delivery tomorrow. It's completion has kept me busy since I got back from our Hawaii trip mid-January. Here's a peek at the bottom portion. My Velvet Elvis - 32"x 43"
It's constructed in my "unraveled" technique with a variety of chenille yarns. 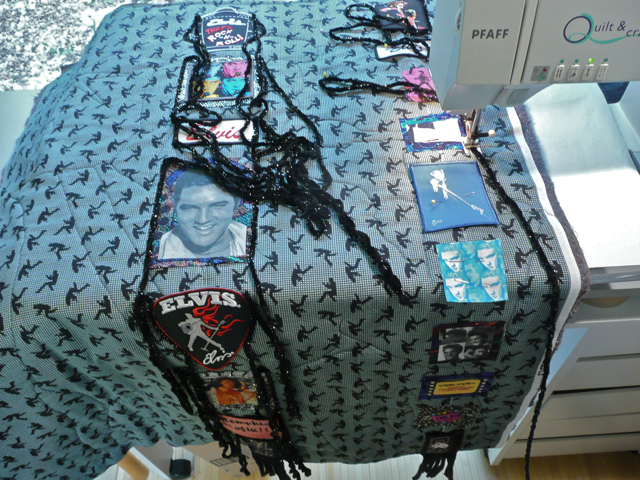 Lengths of those are machine couched around patches of Elvis stuff I had been collecting ... motifs cut from fabric, hats, neckties, scarves, shirts, a silk blouse, and a sock. After this step was finished, I began sewing and hot gluing charms and jewels between the patches and to the borders ... lots of sparkling bling ... somewhere around 1500 pieces give or take a few. 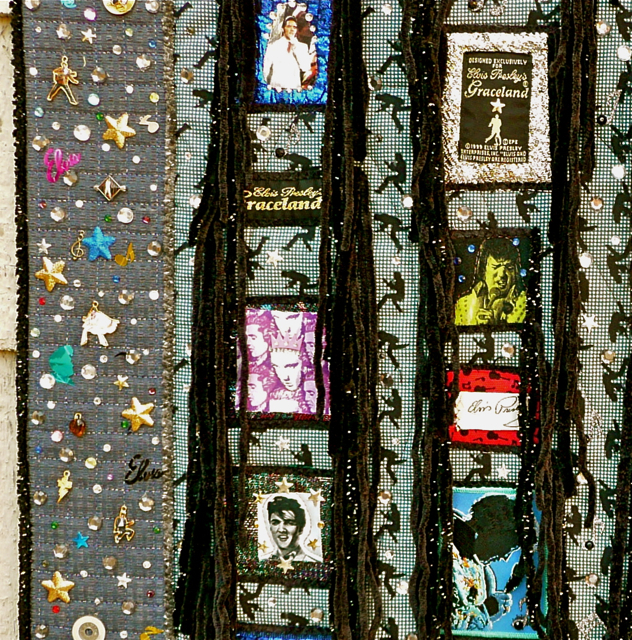 Back then I thought there was an Elvis crazy quilt in my future. 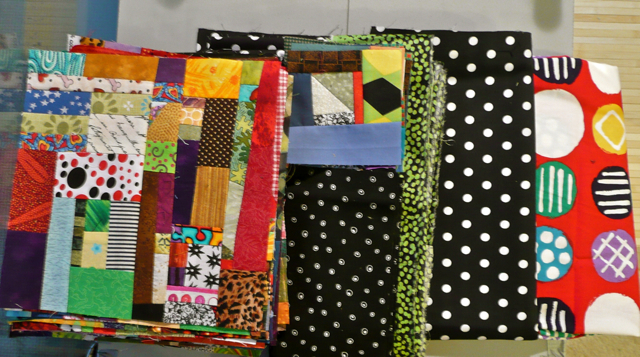 Well, this is a crazy quilt, but not the kind I originally had in mind. 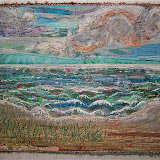 After the quilt show opens this next Friday on March 23 I'll post a photo of the whole quilt. The event takes place for the whole weekend at the Cooper Athletic Center on the Maryville College campus in Maryville, Tennessee. The times are 9-5 on Friday and Saturday and 11-4 on Sunday. Yesterday we went to the Art Extravaganza, Webb School’s annual art sale that features original artworks by more than 70 acclaimed artists from around the country. There was fine art, handcrafted jewelry, pottery, glass art, sculptures and metal art. 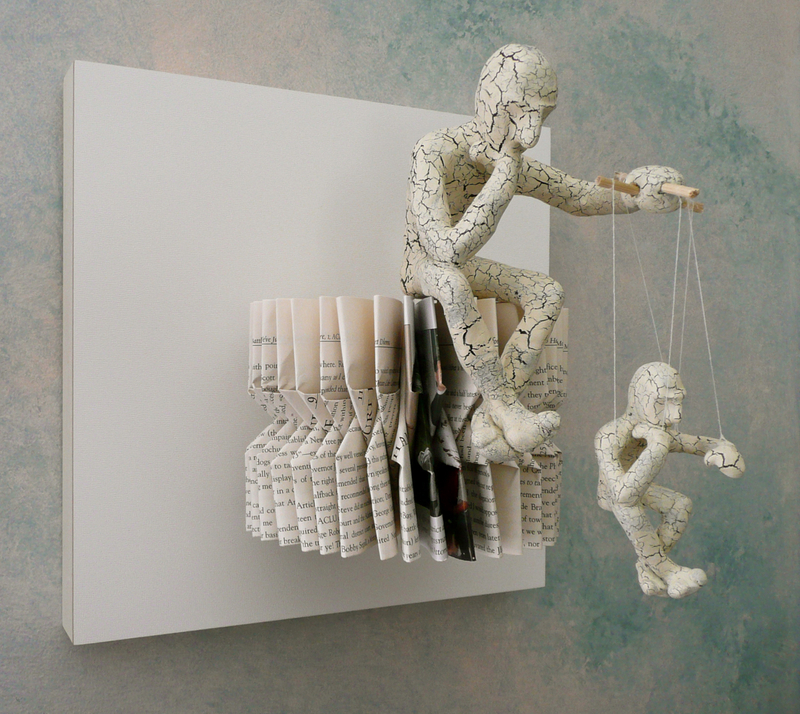 We liked a lot of different artist's work, and were especially enamored with Daniel Lai's wall sculptures that featured reconstructed books (go here to see an interview about his work). It wasn't easy deciding which one to choose (go here to see a selection). This one won out. Thinking Puppet - 12"x 12" x 12"
A major factor in our choice was WHERE IN OUR HOUSE FULL OF ART WOULD IT GO? Recently we had moved an art piece from our bedroom to the entry way by the front door. Thinking about that specific available space and the angle at which a wall sculpture would be viewed made it easier to choose this particular one. It's wonderfully interesting on its own. 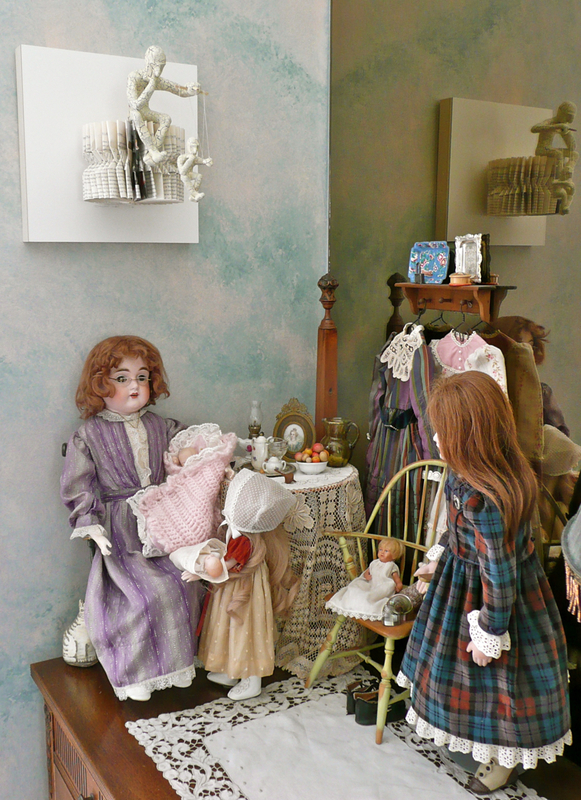 The interaction of the puppeteer with this display of old dolls on my dresser tickles me. Just beyond the end of that dresser is a display of more dolls along with a whimsical Pinocchio puppet and soft sculpture dunce figure, both of which are created by artists. 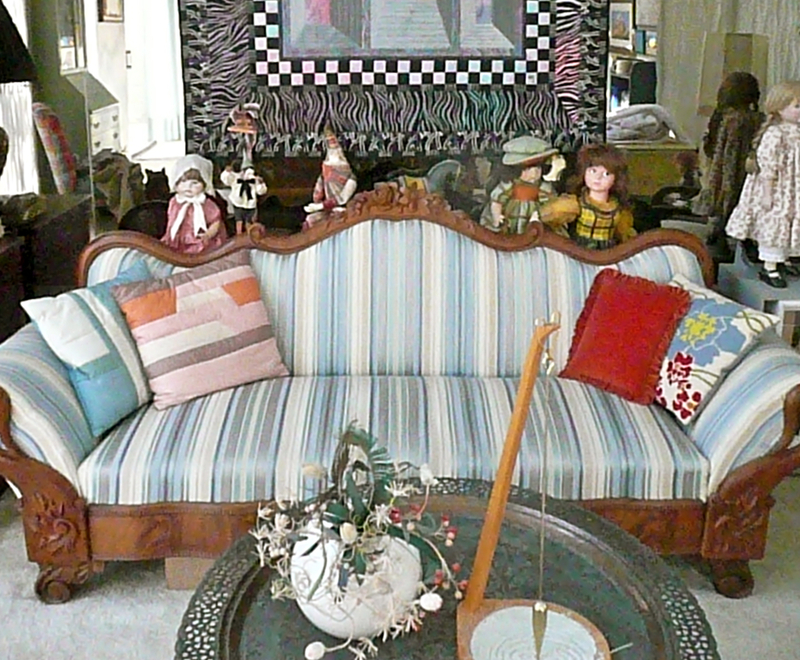 We have an eclectic mix of furniture and art in our bedroom The Victorian rosewood sofa was inherited and the copper and silver Turkish tray table was old when we got it forty-five years ago. For nearly fifty years we've been sleeping in Great Aunt Jane's double bed. This 1970's modern room is filled with light from four patio doors, a full length window beyond the desk plus two celestory windows. 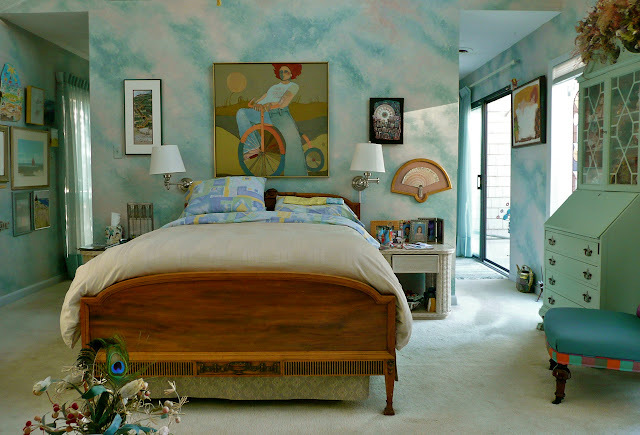 We commissioned an artist to faux finish the walls with a cloud strewn sky effect. Often the morning clouds we see through the up high windows blend in perfectly with the painted ones. Well, I didn't start out to give you a tour of my bedroom. But while I'm at it, here are photo views from each end of the deck that two of the bedroom patio doors open onto. IF Tennessee were warm year around I would be tempted to furnish the deck with the elegant outdoor furniture that looks as if it belongs inside and IF we didn't have to move everything that's out there into our bedroom while we're gone during summer. As it is, it's a wonderful place to have morning coffee and read the paper when it's warm. Also, it's protected from the wind so it can be nice during the cooler months on warmish afternoons. The post about my working on "Unraveled" out there a year ago February is here. 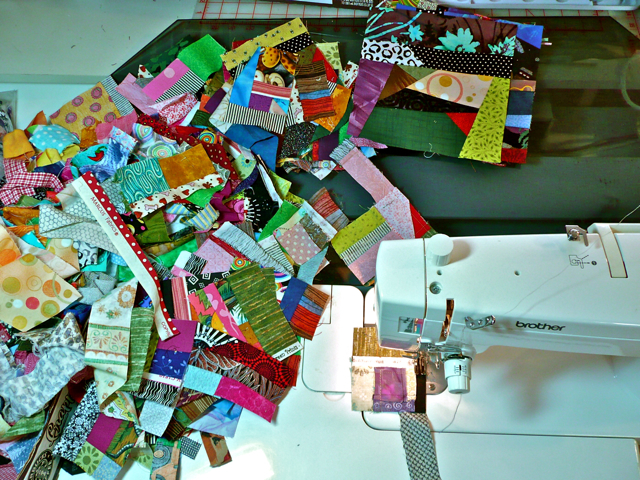 I'm pleased to be the recipient of quite a few scrap bags from my quilting friends. As you've seen in previous posts, I like to stitch those colorful bits together. I delight in how these pieces that are considered too small to be useful go together. I keep combining pieces and sections until I can cut blocks. Here I'm working on 8" ones for a cuddle quilt and pieced 4 1/2" corner squares for it. All twenty-five 8" blocks and sixteen 4 1/2" corner blocks are finished. I also cut forty 8" sashing pieces plus a 4" border from the black fabric with the tiny irregular white dots. The binding is cut from the black fabric with the lime green dots. The big white polka dotted black fabric will surround the cut 24" square of the red with large colorful circles for the back of the quilt. 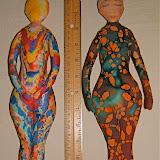 I'd really like to get these parts together to create the delightful quilt I see in my minds eye. However, there are other projects with deadlines that take priority. Soooo....all these pieces are packed up in a "kit" until I can do so.